Last Sunday, against the backdrop of the San Francisco Bay, AT&T Park, construction cranes, and buildings rising out of asphalt, CUESA planted some seeds in a parking lot, much as its founders did in front of the Ferry Building 23 years ago. At CUESA’s inaugural pop-up farmers market at The Yard at Mission Rock, residents stocked up on freshly harvested organic fruits and vegetables and got a taste of hot Italian zeppole, spicy totopos con chile, beef bone broth spiked with ginger and turmeric, and other mouthwatering products. In a city with more than 25 farmers markets, including CUESA’s own iconic Ferry Plaza Farmers Market, why the interest in a new location? But the south-of-Market Mission Rock area is rapidly changing. More than 17,000 new residents are anticipated to move to the southeastern waterfront in the coming years. “The area is ripe for this kind of new community space,” continues Marcy. The first pop-up market included many long-time cornerstones of the Ferry Plaza Farmers Market, such as Eatwell Farm, Dirty Girl Produce, and Tierra Vegetables, sustainable farming exemplars who have helped build the market’s reputation over the years. 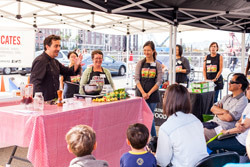 In addition to hosting more than 25 vendors, the CUESA Classroom is also a feature of the pop-ups, with free cooking demos by local chefs and hands-on activities to celebrate the season, such as DIY pickled pepper making. 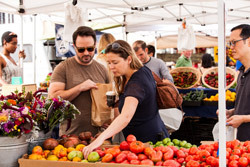 For Co-Directors of Operations Dexter Carmichael and Lulu Meyer, the markets represent a chance to expand CUESA’s capacity for operating high-quality markets that provide a platform for emerging businesses, with an emphasis on new and organic farmers and innovative food crafters. One of those farmers was Joanna Letz of Bluma Farm, who trucked in a dazzling display of organic flowers from her new farm at Sunol AgPark, an 18-acre incubator for small-scale sustainable growers. 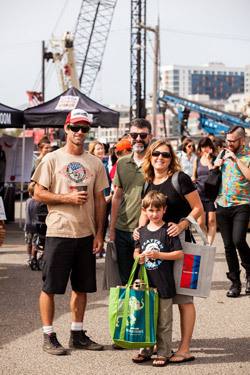 While Sunday’s turnout was modest compared to the crowded Saturday Ferry Plaza Farmers Market, the energy of the market was upbeat and breezy, with a mix of Ferry Plaza regulars and neighboring residents eager to scope out the scene. CUESA will host three more pop-up markets on October 25, November 22, and December 20, each with a seasonal theme, a few vendor lineup changes, and fun and educational activities, like a fall pie contest. Depending on the success of the events, CUESA is exploring the possibility of a more permanent activation at The Yard in partnership with the San Francisco Giants and Bank of America. “We’re really excited about this partnership because both of those iconic San Francisco organizations, like CUESA, have an interest in supporting local community and contributing positively to the local food system,” says Marcy. Save the date for CUESA’s next pop-up at The Yard on Sunday, October 25. Stay tuned for updates at #cuesaattheyard. 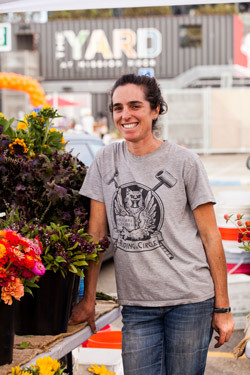 CUESA’s first Mission Rock Farmers Market Pop-Up at The Yard, September 27, 2015. Check www.cuesa.org for future pop-ups. Photo by Amanda Lynn Photography.